Into each life, a little heartbreak must fall, so when it does, be ready with a vase of Proteas. Sometimes called Sugarbushes, these amazing tropical stems come in a wide variety of colors and shapes and are one of the most unique flowers on Earth. 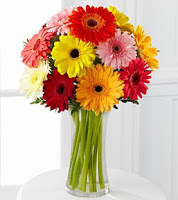 The tall blooms are wild and exotic looking and come in a wide range of colors, sizes and textures. Their diversity will remind you that, while there are many more fish in the sea, there’s just one of you- and she deserves flowers. Native to a widespread geography of Pacific islands and southern Africa, the large, solitary flowers grow in bright reds, pinks, oranges and yellows. With large buds that resemble artichokes, the flowers open up in a dazzling array of color revealing different sizes and hues of petals and fanciful stamens that can’t help but make a gal smile. Some blooms are the size of limes, while others can be as large as a grapefruit and last several weeks as they slowly open. With such bold texture, color and size, a single stem alone looks amazing in a vase and will remind you that, at times, the simple elegance of the solitary life is something to be enjoyed. If you’d like to pair it with another exotic stem, consider the stately bird of paradise or lovely leucadendron. 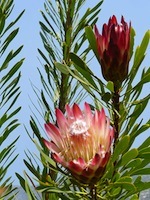 In the language of flowers, Protea are said to convey courage in the face of adversity. 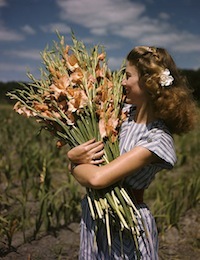 Perhaps this come from their thick stems, which hold the flowers upright and strong even several weeks after cutting. The leathery leaves will remind you to have a thick skin, but are still soft to the touch and often have lovely colors themselves, oftentimes a bright, cheerful green with one shade on the top and another on the bottom, adding complexity to this already beguiling flower. Named after Proteus, the son of the Greek god Poseidon, this flower has become associated with change and versatility. According to legend, this sea-god Proteus was said to have the ability to foretell the future, but would often change his shape and identity in order to avoid having to do so. This ability is ascribed to the changing nature of the sea and tides and has lead to the adjective in English, protean, meaning flexible or ability to adapt- all great characteristics to keep in the forefront when making a fresh start after a break-up. With ancestors dating back to Gondwana some 300 million years ago, the Proteas are some of the oldest flowering plants on Earth and have adapted to a range of environments over time. If time heals all wounds, then a vase of beautiful Proteas will certainly help speed the process along.